Toni Monetti is a half alien who can wield and shape plasma energy as a power. Spoiler and Argent met briefly in the Robin/Argent Double Shot. After the death of her friend Joto, Toni wanted to learn how to be a better hero and went to Robin for help. The two went off to bust some drug runners. Spoiler was instantly jealous when she saw her boyfriend hanging around a heroine in such a skimpy costume ("fashion victim" she called her) but came to the heroes rescue when they were about to be shot, kicking the gun toting hooligans in the face. Toni went after the boat full of heroin, and Steph questioned Tim stringently about his "friend" and he explained the situation. Argent, meanwhile, saw one of the drug runners was a friend of her dad's, and torn, decided to simply blow up the boat. She came back with a lame excuse and Robin and Spoiler scolded her (Steph still jealous), though Steph did defend Argent by saying losing a boatload of heroin should hurt the drug runners. 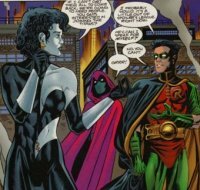 Argent invited Spoiler and Robin to join the Teen Titans. Robin said Spoiler might not be ready, much to her anger. But later, Tim did relent and take Spoiler along to Titan tryouts, though they both decided not to join. Learn more about Argent here and here.